Measles are highly contagious, but the vaccination is considered 97% effective, according to the Centers for Disease Control and Prevention. "There's no question that vaccines are safe, effective and life-saving," de Blasio said. "The bottom line is to recognize that this is something that has become even more urgent." "They have been spreading dangerous misinformation based on fake science," he said. "We stand with the majority of people in this community who have worked hard to protect their children and those at risk." The outbreak began in October, but many of these new cases were confirmed in the last two months. The vast majority of cases are children under 18 - and most of these measles cases were unvaccinated or incompletely vaccinated people, health officials said. Members of the City's Department of Health and Mental Hygiene will check the vaccination records of people who may have been in contact with infected patients. Those who have not received the vaccine or do not have evidence of immunity may be given a violation and could be fined $1,000, the mayor said. 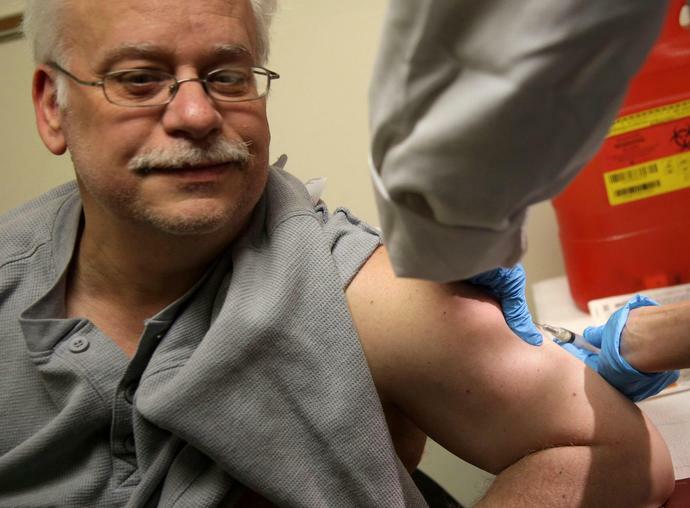 "We've seen a large increase in the number of people vaccinated in these neighborhoods, but as Passover approaches, we need to do all we can to ensure more people get the vaccine," Barbot said. Measles was first introduced into the community by someone who picked up the disease in Israel, which is dealing with its own outbreak, health officials said. "It does interconnect with the anti-vaxx movement that is not just in the community, its national and its causing lots of problems," de Blasio said Tuesday. On Monday, the city Health Department has issued formal orders to all yeshivas - jewish schools - in Williamsburg to comply with the mandatory exclusion of unvaccinated children or face fines and possibly be shut down. The surge has been fueled in part by the anti-vaccination movement - most people who contract measles have not been vaccinated, the CDC said. If one person has the disease, up to 90% of the people close to that person will become infected if they are not immune, the CDC warned. The United States recorded 695 cases of measles in 2019, the most of any year since the disease was declared eliminated in 2000, health authorities said Wednesday. "The high number of cases in 2019 is primarily the result of a few large outbreaks -- one in Washington State and two large outbreaks in New York that started in late 2018," the Centers for Disease Control and Prevention said in a statement. The resurgence of the once-eradicated, highly-contagious disease is linked to a growing anti-vaccine movement in richer nations -- which the World Health Organization has identified as a major global health threat. The number of measles cases in the U.S. has surged past 680, the highest total in this century, largely because of increased opposition to vaccines.